Last week we were in a school making mosaics with children for the entire week. We’re always looking for ways to give children more creative decision making and control when using this process so I decided to explore some ideas with art club this term. 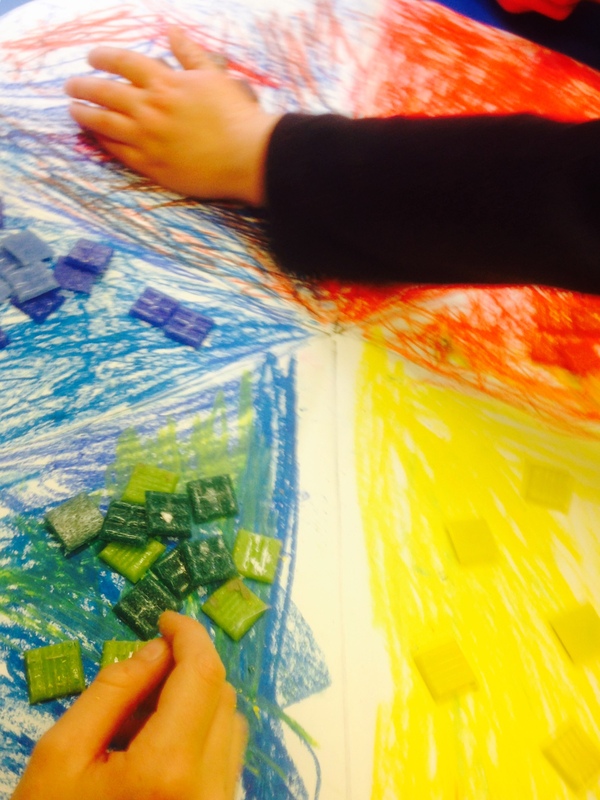 In this first session the children worked as a group to create their own colour wheel and think about colour mixing. They placed a selection of glass tiles where they felt they should sit on the colour wheel. Then, to think about the idea of contrast which is really important in mosaic, they took sheets of coloured paper and looked for tiles that really stood out against the background colour. Interestingly a lot of children automatically tried to match the colours so I probably need to think about how I explain the concept of contrast. As a group we talked about the colour choices. The children used what they had learnt to plan some very simple mosaics which they’ll start work on next week. 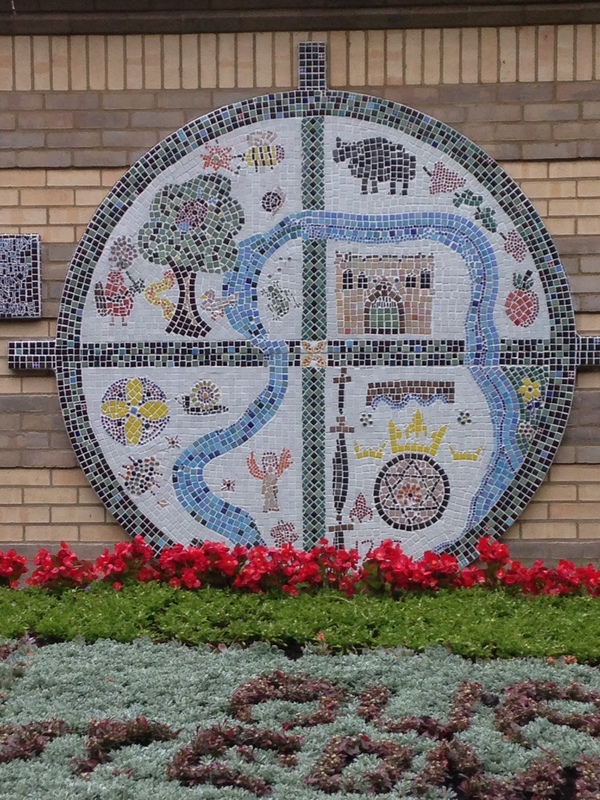 This mosaic was made as a community project by Risbygate Arts about 10 years ago and has been hidden away on a wall by the loos in the Abbey Gardens. Bury in Bloom were brave enough to move it to a new prominent location overlooking the Magna Carta flower bed and asked Rojo Art to look at doing some renovation work on it for the Anglia in Bloom judging. My first inspection of it wasn’t very positive: there were about 200 tiles fallen off and a good coating of mould in parts. Strangely though, once I got started this turned into a very addictive and satisfying process. I also had the added entertainment of explaining the mosaic’s history to interested park users. 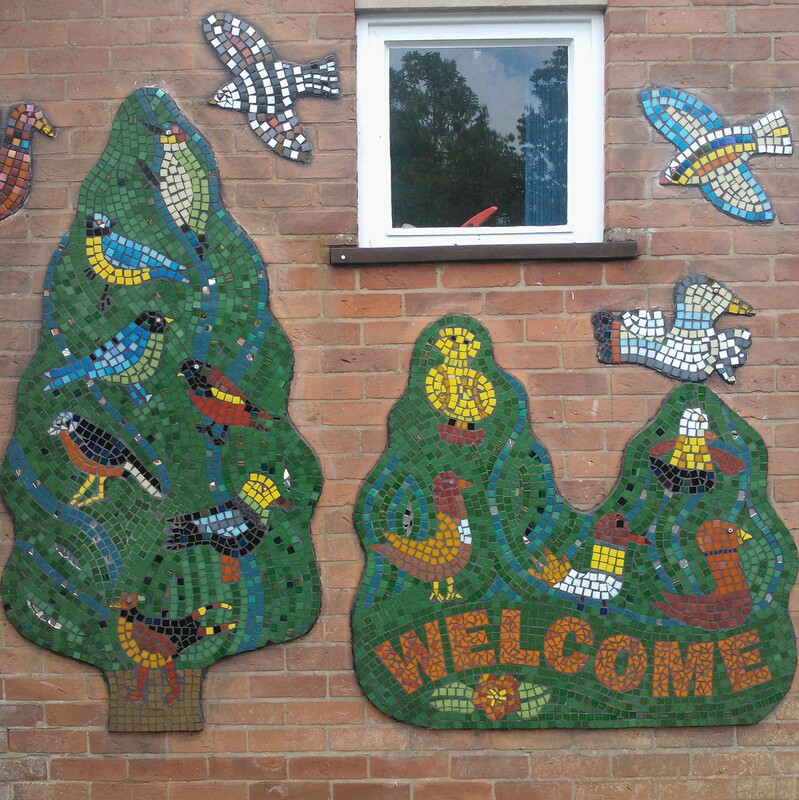 Elveden Primary wanted a mosaic inspired by their forest location to brighten the wall outside their main entrance. The children worked on the bird designs in school ahead of the project start and arrived on the first day with plenty of ideas. They then worked in small groups creating the bird designs in glass tiles. They particularly enjoyed used the tile nippers to get the shapes they needed. The birds were glued to the mosaic bases outdoors and the children took turns to work with the artists on the swirling lines of the mosaic background.